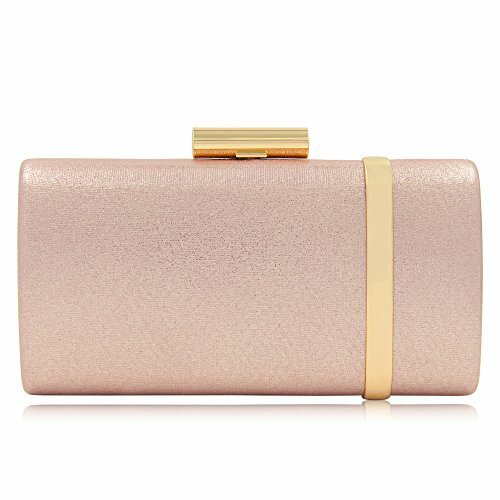 Women Bridal Metallic Evening Clutches Handbag Sparking Solid Clutch Purses (Rose Gold) by Mystic River at Purse Outlet Coach. Hurry! Limited time offer. Offer valid only while supplies last. VERSATILE DESIGN: This clutch handbag with metallic decoration captures all the surrounding eyes,Princess style dress can match with this evening clutch,make more fashionable and elegant. FLEXIBLE CARRY:You can hold this formal clutch purse in your hand or you can also use it as a shoulder bag with the chains in some events,with more convenience. FLAWLESS INTERIOR: Enough space for your valuable thing,such as smartphone,Iphone 7 plus iphone 8plus, keys, wallet,some make up and crebit cards. NICE SIZE/WEIGHT: 7.9 x 2 x 5.1 inches. 1 Pound Per clutch evenin bag. Attached with 47 inches shoulder strap. Easy to wearing. OCCASIONS:As evevning bag is perfect for parties, weddings, date nights, or family reunion, prom, banquet and cocktail party when you take part in special occasion.